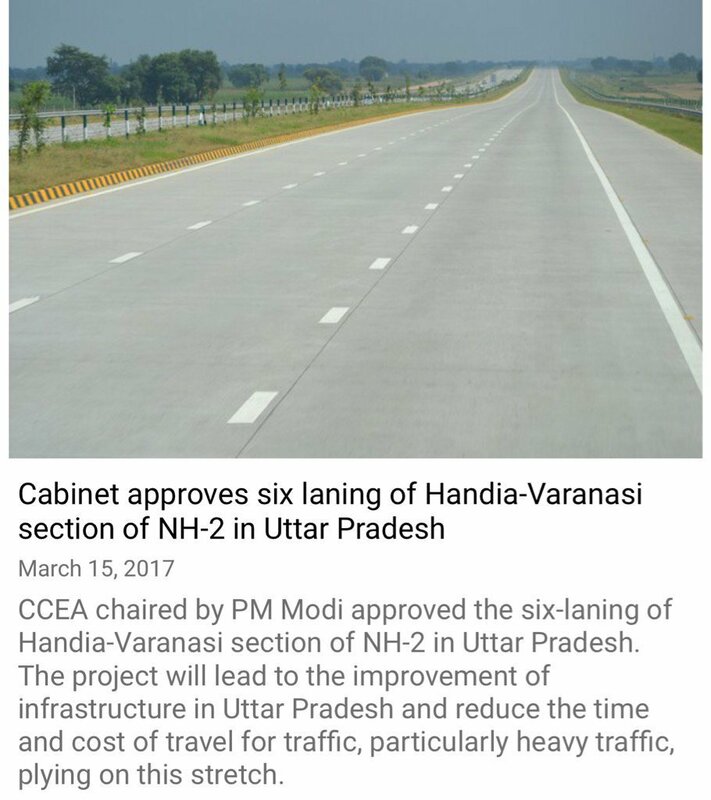 The Cabinet Committee on Economic Affairs, chaired by the Prime Minister Shri Narendra Modi, has given its approval for development of the six laning of Handia-Varanasi section of NH-2 in Uttar Pradesh. This work will be under the National Highways Development Project (NHDP) Phase-V. The approval is in Hybrid Annuity Mode. The cost is estimated to be Rs.2,147.33 crore including cost of land acquisition, resettlement and rehabilitation and other pre-construction activities. The total length of the road will be approximately 73 kms. The project will lead tothe improvement of infrastructure in Uttar Pradesh and reduce the time and cost of travel for traffic, particularly heavy traffic, plying on this stretch.The development of this stretch will also help in uplifting the socio-economic condition of the concerned regions of the State and would also increase employment potential for local labourers for project activities. It has been estimated that a total number of 4,076 mandays are required for construction of one kilometre of highways. As such, employment potential of 3,00,000 (approx.) mandays will be generated locally during the construction period of the project. The project is covered in the region of Handia and Varanasi.